Western States offers a complete line of cable ties, cable tie mounts, accessory products, installation tools and more! We offer unique and innovative products. Our high-quality cable ties are used everywhere... for securing and routing wire bundles, tagging, pairing, sealing, and a variety of other applications. Avery DennisonTM Cable Ties. How can we help your business? Available in lengths from 4" (102mm) to 34" (838mm) with tensile strengths up to 175 lbs. Chances are we have a cable tie for your application! Avery DennisonTM cable ties are available in sizes from 4"(102mm) to 33"(838mm) and in three different materials. With tensile strength ratings up to 175 lbs. and bundle diameters ranging from 1/16"(1.6mm) to 10"(254mm), we have the product for you. In addition to traditional cable ties, we also offer a wide variety of specialty products, mounts, and installation tools. Avery Dennison Fastener Division entered the cable tie market over 25 years ago by developing innovative products. Their unique stretching process produces premium-quality, superior-performance cable ties. Avery Dennison sets the toughest standards in the industry; as well as being QS-9000/ISO9001 certified, our products conform to all applicable UL and military specifications. Also available in the cable tie line are these types of ties. Length: 4", width: .095", thickness: .041"
Length: 5.5", width: .130", thickness: .048"
Length: 8", width: .130", thickness: .054"
Length: 7.5", width: .177", thickness: .050"
Length: 11", width: .177", thickness: .053"
Length: 15", width: .177", thickness: .053"
Length: 14.5", width: .251", thickness: .074"
Length: 21", width: .303", thickness: .075"
Length: 24", width: .303", thickness: .075"
Length: 28", width: .303", thickness: .075"
Length: 34", width: .350", thickness: .086"
SECUR-A-TIE® AND SECUR-A-SEALTM FASTENERS, AVERY DENNISON INNOVATIONS. Commonly used in the retail market for tagging and securing merchandise, Secur-A-Tie® offers economical bundling and attaching solutions. Secura-A-Tie® is also used in other markets, particularly when cost is an important consideration. Secur-A-SealTM offers economical bundling along with a tamper evident head design. Secur-A-Seal TM is UL listed and is used for fire extinguisher pins and other applications requiring a lower tensile strength. Length: 5", thickness: .070" dia. Length: 8", thickness: .070" dia. Length: 7.5", width: .177", thickness: .048"
Length: 7", width: .140", thickness: .040"
Length: 11", width: .140", thickness: .040"
Length: 6", width: .094", thickness: .044"
Length: 8", width: .094", thickness: .044"
Length: 11.5", width: .140", thickness: .055"
Length: 15", width: .140", thickness: .055"
Length: 7.5", width: .250", thickness: .050"
- Reduces costs by decreasing labor time for pairing merchandise and locating separated items. - Unique "stop" prevents shoes from being cinched tightly together, allowing for an organized and uniform appearance. - Difficult to tamper with but easy for customer to remove. -Thin cross section allows product to be used with almost any shoe, even those with small eyelets. Dimensions of head: Length: 11", width: .140", thickness: .040"
Length: 8", 11", 21" , width: .130", thickness: .054"
The Avery Dennison Ski Tag Security Tie is a safe, affordable, and versatile alternative for tamper-resistant, dependable closures. The Ski Tag Security Tie is revolutionizing the ski industry by addressing a growing problem in ski areas and resorts throughout the United States--revenue lost by skiers "sharing" or re-using lift tickets. Length: 4" , width: .095", thickness: .041"
Length: 5.5" , width: .095", thickness: .041"
Length: 7.5" , width: .199", thickness: .050"
Length: 7" , width: 11", thickness: .04"
Length: 7.5" , width: .177", thickness: .055"
Length: 11" , width: .177", thickness: .050"
Length: 14.5" , width: .250", thickness: .075"
BAR-LOK INSTALLATION TOOLS ... THE INDUSTRY STANDARD FOR COMFORT, SAFETY, PERFORMANCE AND RELIABILITY. Simple to use - place tie around bundle and pull hand tight. Apply tool at head of ties and squeeze. Tie is pulled to pre-set tension and cut off in one simple operation. The improved design of the 08480, 08381 tightens cable ties with significantly greater force at high settings. Pneumatic version maximizes productivity with less hand effort. A touch of the trigger tensions and cuts the cable tie flush in just one second. Operates at 90-110 psi. 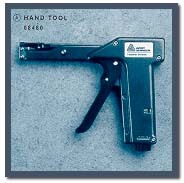 The 08480, 08381 and 10639 Tools are made of rugged aluminum housing and are ergonomically designed for operator safety and comfort. 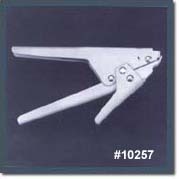 The tool cuts the cable tie flush and retains the cut portion until the tension lever is released so projectiles will not injure employees or interfere with work area. For extended life, replacement cutting blades are available. Cable Tie Mounts stabilize and secure wiring bundles in a variety of applications. Identification Plate 1-1/2 " -- 3/4"
© 1999, Western Supply Co.